This Wholly Imperfect Life: I am not in control! I am not in control! I'm back. I was out of commission. A bit shaken up by some recent news. News that shifted my gears. Gears I had been grinding for a few months now. There is nothing more revelatory than receiving news that makes you stop. Stop. Pause. Take stock of your life. I'm still taking stock, so to speak. I am grappling with many things. But probably the most difficult has been the acute awareness of my weaknesses. Yes! My weakness. God has regard for my weakness and for this, I thank Him. I am blessed beyond measure. I have riches to speak of that go far beyond the material kind. And still, I am weak. Very weak. I am like the son kneeling before the Father in this Rembrandt painting, Return of the Prodigal Son. Why do I chose to speak of weakness. Perhaps it is all providential. I feel it is. The opening of the "Year of Mercy", declared by Pope Francis officially began a week ago. Why the Year of Mercy? Well, if we take a look at our world at the present moment, we cannot help but think how much mercy is needed. Every human being longs for mercy. 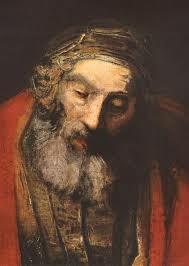 Mercy is the willingness to help those in need, especially those in need of pardon or reconciliation. Mercy is healing. Mercy is restorative. Mercy is the essence of love. God is merciful. That is who He is, not what He does. God is mercy. In my weakness I recognize that I am in need of mercy. I am in need of God. He is in control of everything. When we stop and take stock of our lives, we may very well come to realize that we are not in control of our lives. Being in control is but an illusion. Yes, we wake up every morning and get ready for our day. We go about our chores, studies or whatever it is that we have to do. We systematically organize our lives the way we choose to; the way we need things to be done. But, what if we hadn't woken up? What if, for some reason, we were unable to "do" the things we normally do; unable to do things for ourselves? What if the loved ones we share our lives with were no longer around? We control none of these things. And yet, they are so intricately connected to everything that we do, everything we are. None of it can be changed by us. None! We may think we are in control. Yet, if we look at the bigger picture, we really aren't. My weakness? My weakness is in fact this: I believe I control it all. However, the only thing I truly control is love. How I love. Whom I love. Surrendering to love. Surrendering is love. Surrender is required of love. Surrendering to the Creator, who loves us so much, is a testament of our trust in Him. We ultimately trust that what He does for us, is what is best for us. Even in times of difficulty. This is love. Lest I forget to take stock of my weakness, I may forget, yet again, that I am not in control. May God remind me of my weakness each day. May this daily inventory of my weakness make me humble so that I may recognize that I am in need of His mercy, a mercy to be given away. Please pray for me. Pray for my conversion of heart so that my weaknesses may belong completely to God rather than become a project of vain improvement that will only reflect self pride. Son is poor and desperate. 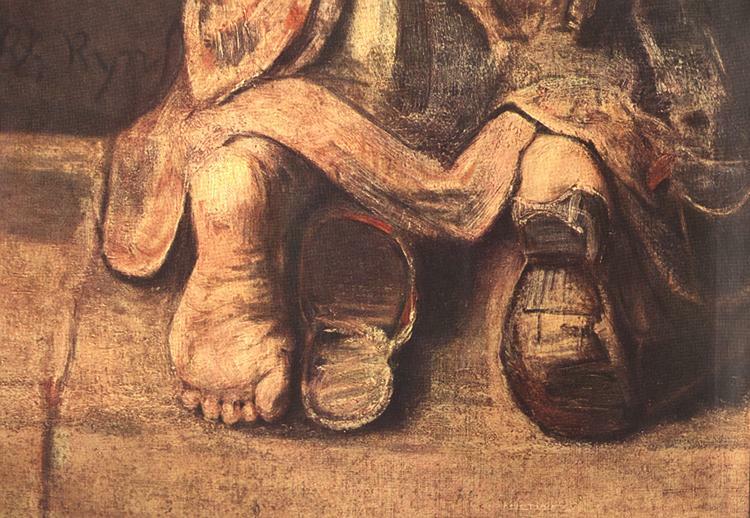 Clothes tattered and torn, representing our weaknesses and poverty. Kneeling before the father in search of his mercy. Light cast upon father and son as they embrace shows the grace of the relationship. Although the son has no shoes he still has his sword (on the right) which symbolizes that his dignity remains. Son of a nobleman. The father's cloak is rich in color and seems to embrace the son. The father is elderly and only loves and welcomes his son. The left hand of father is strong and masculine and the right is soft and tender showing the fathers strong masculine side and the motherly tender side of God the Father. The characters off to the side are more in darkness because they are unable to bring themselves to step into the father's grace. By their own choice they remain off to the side. 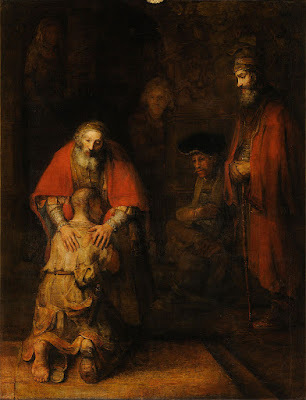 You can read much more in Henri J. M. Nouwen's book "The Return of the Prodigal Son."